On Friday afternoon, a group from Queretaro, Mexico appeared. 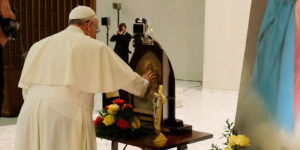 They don’t belong to Schoenstatt, but they know about the shrine there. 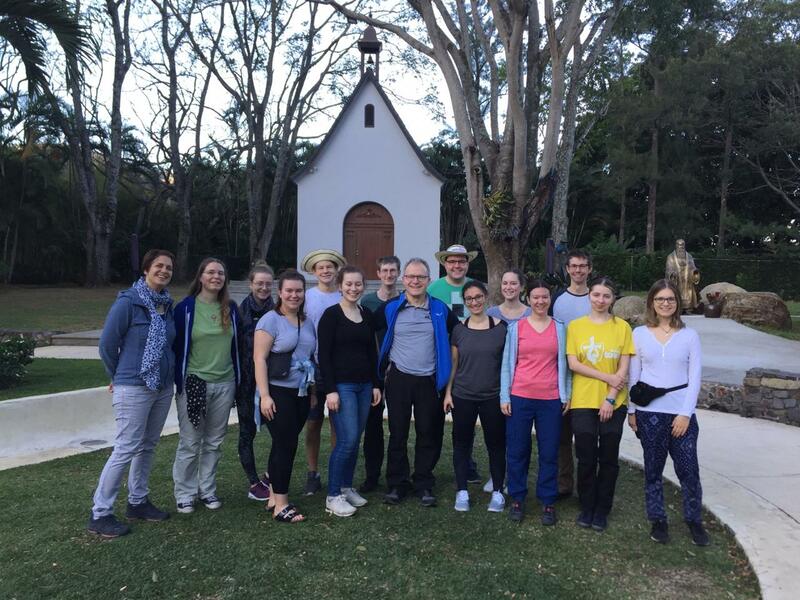 The came to learn about the Costa Rican Schoenstatt Shrine. They attended Mass, ate something, and continued forward – filled with good memories. “Many of these young men are just getting acquainted, we are from allover of Brazil. 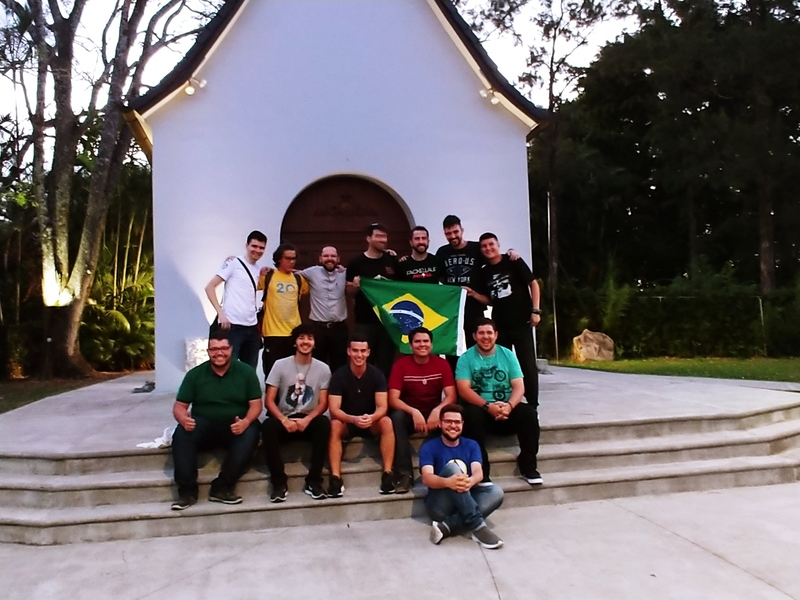 One is from Brasilia, another from Atibaia, another from Rio de Janiero…” Some twenty, young men, accompanied by Fr. Alfonso Wosny, arrived on Sunday afternoon, tired from the trip and full of hope. 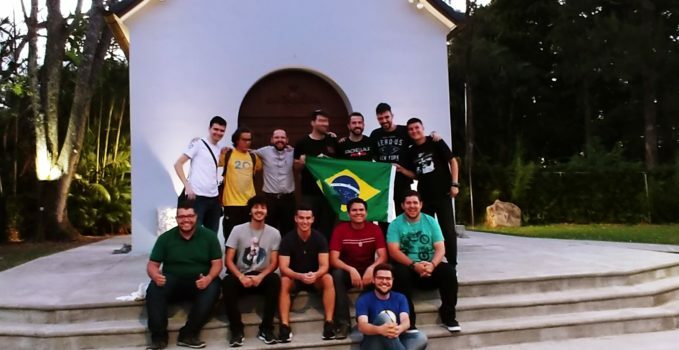 Even before drinking any coffee or tea, they ran to the shrine and began to sing and pray… Two or three of them wore the Fackellauf Brazil t-shirts. 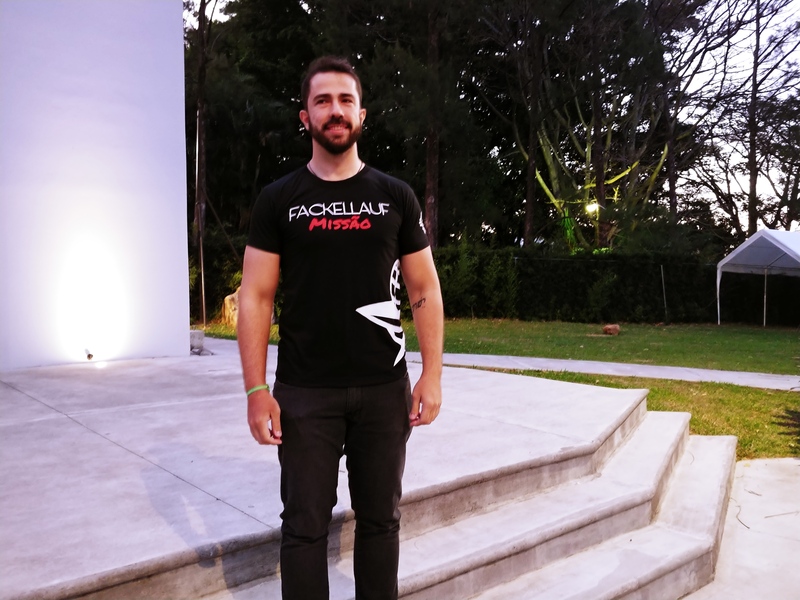 “I am Flavio, and you published my article about Fackellauf!” one of them exclaimed, “I am so happy to meet you!” They commented on the way that Fackellauf, inspired during the 2014 Jubilee, motivated and changed them. 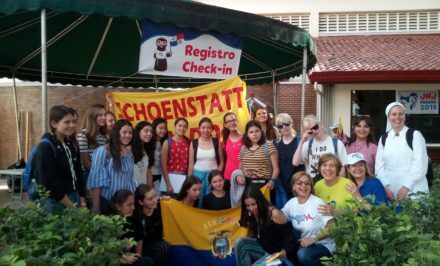 Gabriel asked me: “Do you have Wi-Fi?” And in a few minutes, we literally did what schoenstatt.org’s mission is: Schoenstatters connecting Schoenstatters. 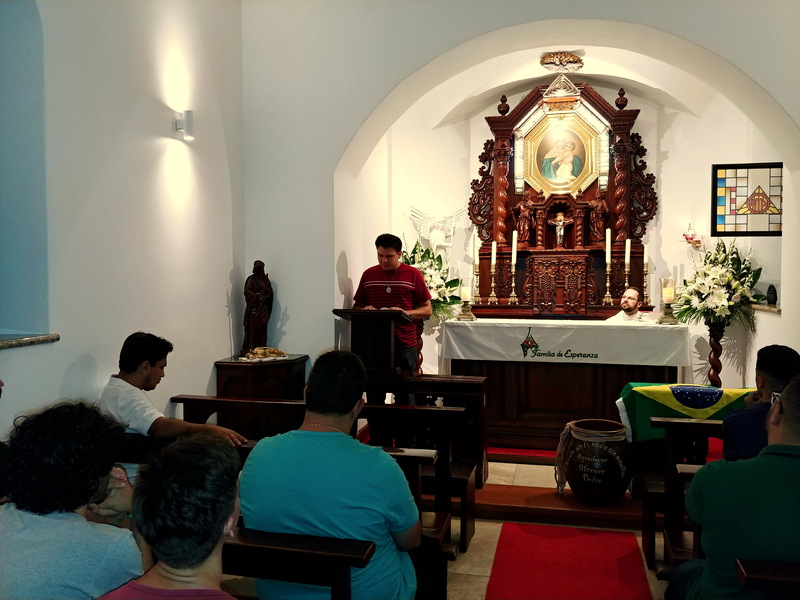 A great concern at the last National Forum of JUMAS (Boys’ Youth) from Brazil was how to make more news about their life and apostolate reach schoenstatt.org. 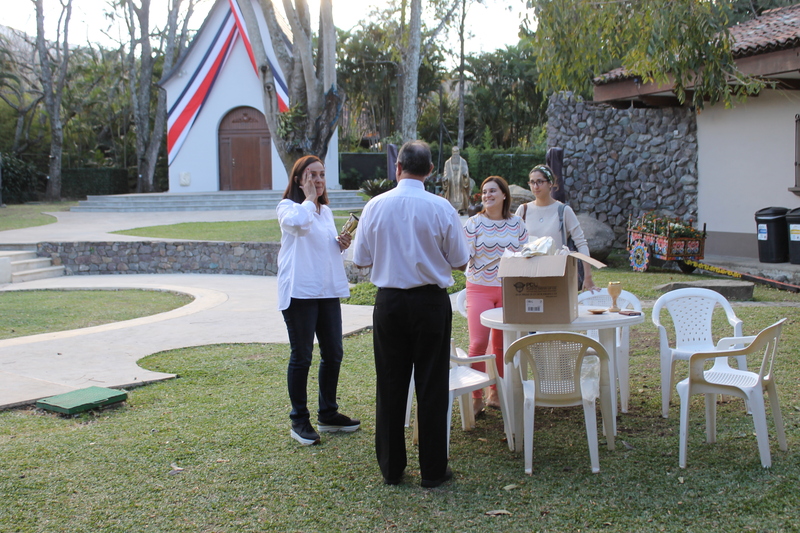 “Now I can ask you directly!” A mini-workshop in Kentenich communication and the MTA’s style we have on schoenstatt.org, a simple invitation to send what they think can serve others’ lives, exchanges of address, and everything was set. At the beginning of the Mass, Fr. 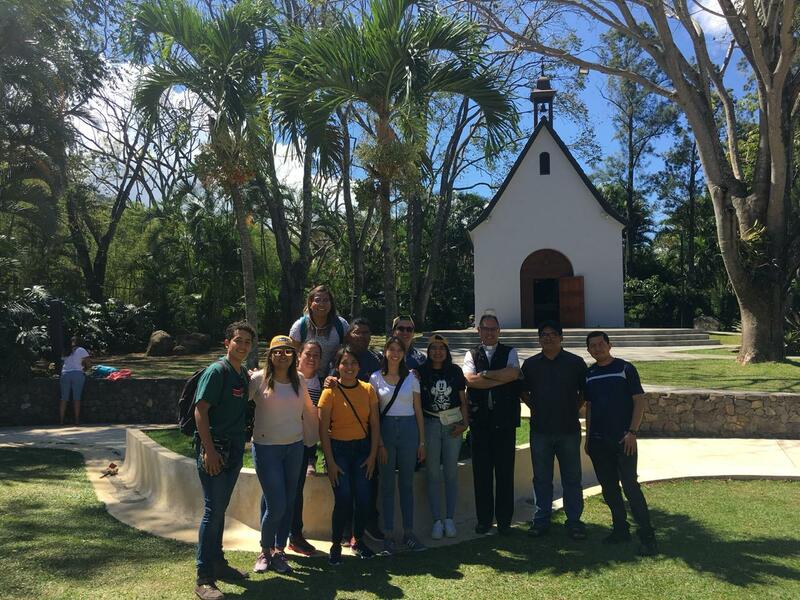 José Luis Correa shared a little about Schoenstatt’s history in Costa Rica: the Movement and its activities. 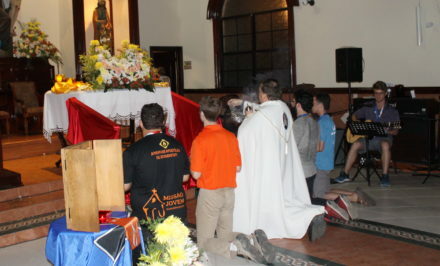 Especially the mission of reaching out towards other Central American countries, to support the founding process over there: Guatemala, El Salvador, Nicaragua, Panama… After an emotional Mass and songs, the “rite” of Franz Reinisch’s song could not be left out and subsequently was shouted out with pure love: “Make me a Schoenstatt apostle!” A fire of Christ’s Tabor that was contagious in the square of the two-year-old shrine transformed during this time into a burning heart for Schoenstatt’s future. After a delicious and great exchange, the young men went with their hosts to their homes, to return Monday morning to celebrate Mass and go to some tourist sites— a volcano and cataracts were among them— everything was organized for them on the spot. 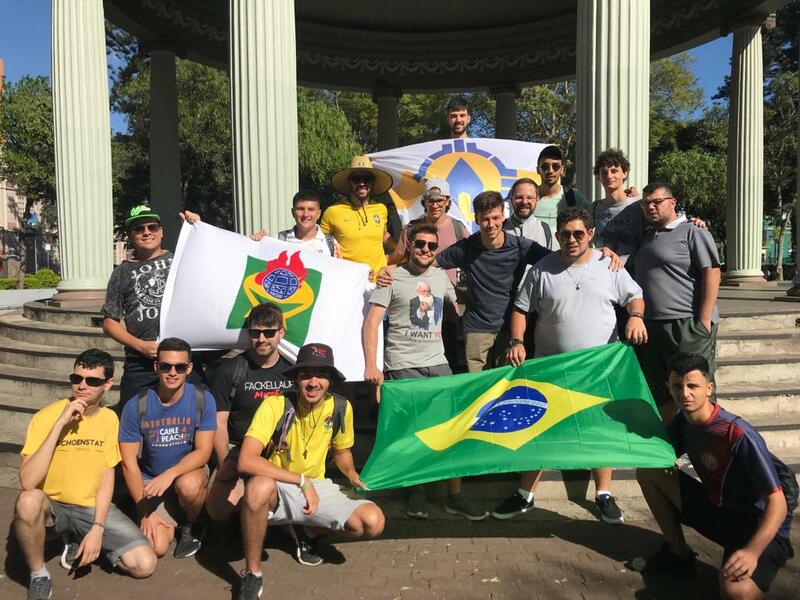 A group of young men from the Archdiocese of Freiburg, Germany arrived very late on this same Sunday; the Vocational Pastoral Center heads up this group. None of them belong to Schoenstatt, except Fr. Palwelzick, of the Schoenstatt Institute of Diocesan Priests, who accompanied the group. They received lodging at the Movement House, and they left early Monday, happy and grateful, after attending Mass in the shrine. On Monday, the grounds of the shrine were filled with people, although no groups would be arriving. They were young people who were preparing the international gatherings, the shrine for the Mass, cooking meals and providing water, tea, coffee, and much more. 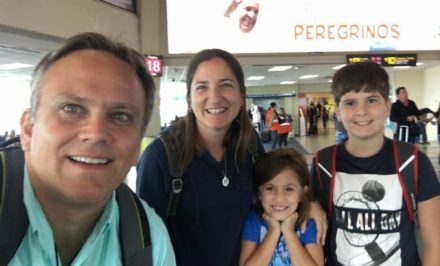 Those who worked on logistics, welcomed, and there were many who simply wanted to be present in apostolic waiting…This is a shrine with life where every pilgrim feels, important, welcome, and a participant— like family. The usual noon mass with Fr. José Luis Correa was held. The Mass at 7:00 pm was a surprise since Fr. Alberto Celis, from Peru, of the Federation of Diocesan Priests, wanted to celebrate Mass upon his arrival. There was a Mass at 8:00 pm, which Frs. 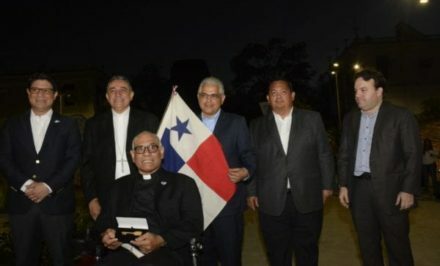 Andrés, from México, Jesús Ferras, from the United States, and Martín, from Tucumán, Argentina, of the Federation of Diocesan Priests con-celebrated—we will be sharing more about this Mass in another article. For a quite some time, Fr. Martín Aversano contemplated on Fr. Kentenich’s statue, which was softly illuminated at dusk. “One can speak with him,” he said to a man from Costa Rica. Three people were with him, and we began to talk about Fr. Kentenich’s mission that now is ours to assume, then after a while we felt that we talked with him, and he with us.